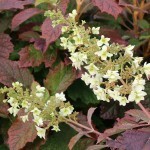 It is a fast growing, coarse textured shrub. It has large (12-15") panicles of white blooms in early summer. The flowers have multiple florets giving the individual blooms a double look. 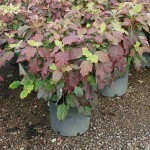 It tolerates sun or shade in a well-drained soil. The fall color is burgundy red.